Celebrating this Sunday's return of HBO's fantasy epic, Game of Thrones, (Monday in the UK) is a collaborative exhibition currently at Brooklyn's Bottleneck Art Gallery. 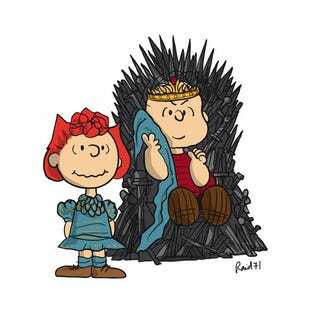 I have picked out many of my favourite pieces on my site (most of which you can buy online if you don't happen to live near New York) but I felt I also felt I had to share these wonderful Peanuts X GOT mash-ups by Raid71 with you guys. Wonderful stuff I'm sure you'll agree, Peanuts style Jon Snow looks particularly fed up with his lot in life. Good grief. This set is available to buy from Bottleneck right now.